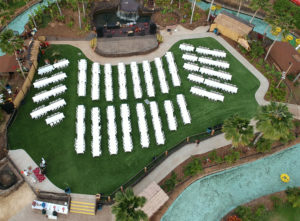 Overhead view of Chief’s Luau show stage and turfed dining area built and installed by IPR Hawaii, at the Wet ‘n’ Wild Water Park in Kapolei, HI. 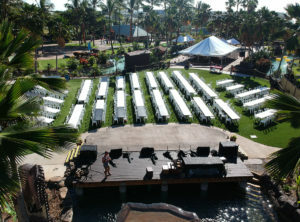 View of Chief’s Luau show stage and turfed dining area at the Wet ‘n’ Wild Water Park in Kapolei, HI. Built by IPR Hawaii. Although we’re known mainly for our parks, sports & play projects, we also have the skills and capacity to handle general construction projects as well. Click here to view more of our general construction type projects. Chief’s Luau at Wet ‘n’ Wild in Kapolei, HI. 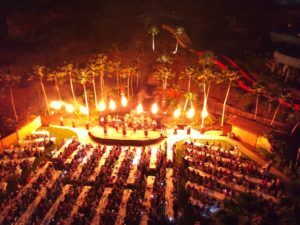 Stage and synthetic turf dining area installed by IPR Hawaii.